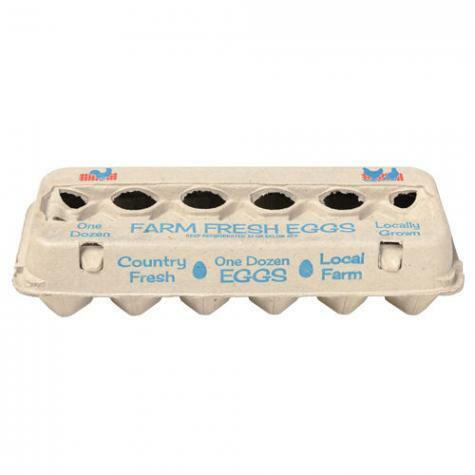 Preprinted egg cartons are made of 100% recycled fiber paper-pulp material. "Keep Refrigerated At Or Below 45˚F"
Well made carton with crisp, clear lettering. Has all the necessary handling and safety labeling. Includes a nice blank spot for your own label. 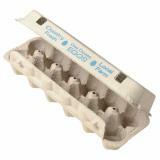 Good quality egg cartons for gifting my fresh eggs. 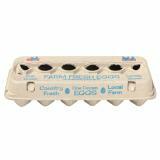 The cartons are printed very nicely, inexpensive, sturdy, and fit all size of eggs except the jumbo, which aren't laid too often. Great egg carton, much better than the standard carton eggs come in at the supermarket. Awesome. Just what I needed. Just not sure why signature is required upon delivery. Got tired of begging people to bring back the cartons! These are just what I needed, although I'd prefer no ink at all. Just plain!